The Round-Up (or RoundUp) is an exhilarating ride which takes place inside a spinning disc. Passengers stand up against the wall with a thin chain attached around them for safety. 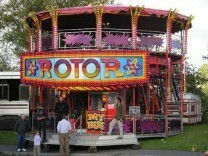 The Rotor amusement ride is very similar to the Roundup and was actually its predecessor. 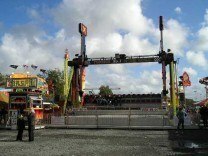 This is a ride for more experienced fairground attendees and those who enjoy fast rides! 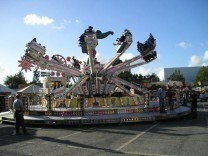 Ideal for those who enjoy faster rides at the fair, the Orbiter consists of groups of cars which are lifted up off the ground by several arms on the machine once the ride begins to rotate. Roller Coasters are a popular attraction for everyone, intelligently designed to rise and dip to create a thrilling experience. Originally known as “The Ocean Wave”, the pirate ship is a popular amusement ride that swings back and forth, to create the feel of sailing a rough sea. 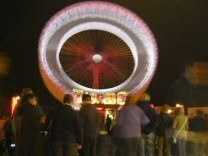 Also known as “Kamikaze” or “Double-Arm Ranger” The Skymaster is a pendulum amusement ride. This ride swings passengers backward and forwards before spinning them upside down. 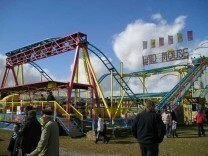 The Matterhorn funfair ride is also known sometimes as the Musik Express or Terminator. It consists of a number of cars that are attached to an axel, swinging the cars in and out. The swinging motion is created by the shape and build of the ride. 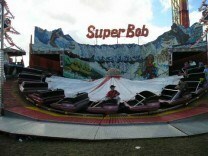 The Super Bob is similar to the Matterhorn in design. Cars rotate on a track that has sloped and flat sections causing the cars to spin at thrilling speeds. The Jump and Smile funfair ride, is a funfair ride that has chair cars arranged on a number of arms pointing out from around a central axis. The Jump and Smile will lift you into the air at random intervals whilst spinning you around. 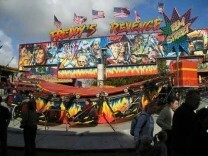 The Super star is a classic fairground ride that is not for the faint hearted. This big thriller will spin you into the sky at high speeds. 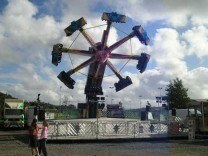 The Top Spin is a funfair ride that will spin you up in the air at colossal heights. 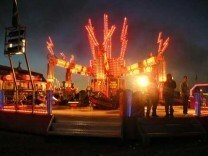 This is definitely a funfair ride for the thrill seekers.